HomeWapkaDesignWapka me social share icon or social follow icon code kaise add kare. Wapka me social share icon or social follow icon code kaise add kare. Hello friends... Is post me ham apko Wapka site me social share icon or social follow icon lagane batayenge or sath hi wapka social share link code or social follow link code bhi denge. Dono code apko yahi par mil jayengi. Social share icon or social follow icon me kya fark hai. Ye ham apko pichhali post me bata chuke hai. Isliye in dono icon ke bare batane me ham time west nahi karenge. Agar vo post nahi padhi. To pahle Ye post padhiye. Ab baat karte hain social icons ki. Friends ham social share icon or social follow icon, in dono ke hi 2-2 code laye hai. To jo code apke wapka site ke liye sahi ho. Ap us code ka prayog kijiye. Sabse pahle ap code dekh lijiye. Or us code ke fayde or nuksan dekh lijiye. Ye text share icon hai. Ise simple share button bhi kahte hai. Ise lagane ka fayda ye hota hai. Isase site ke loading me koi prabhav nahi padta. Or nuksan ye ki visitors ko jaldi nahi dikhate. Blog ke liye to ye code best hai. Lekin wapka ke liye. Is code me ek kami hai. Or vo ye ki, ye code wapka ke home page ko hi share karta hai. Bhale hi ap wapka site ke, kisi bhi dusre page ko share kare. Lekin share home page hi hoga. Example: agar ap kisi song ke download page ko share karte hain. Lekin us share link me agar koi click karega. To vo sidha home page me hi pahunchega. Naki song ke download page par. 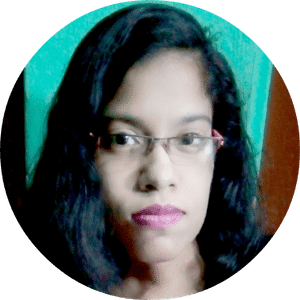 Par Blog ke liye is code me koi kharabi nahi. Ye social icon code hai. Jo mere khyal se wapka ke liye best hai. Isme bahut sare sharing option hai. Isme ap jo page share karna chahe. Kar sakte hain. Hame ye code bahut pasand hai. Ap shere par click kar ke check kar sakte hai. Share button hamesha footer me achcha lagta hai. To ap footer me ye code lagaye. Padhe footer page kaise design kare. Footer pag me jaiye. Fir :: EDIT SITE (#) :: me jana hoga. Fir WML/XHTML code me jaiye. Yahan social share code rakhe. Jo code ap lagana chahte hain. Ise aise hi rahne de. Yahan left, center or right choose kare. Yahan par position choose kare. Ki share button kahan par hona chahiye. Sab set kar lene ke baad, submit kar de. Ab apka icon lag chuka hai. Ek baar test kar le. Sahi kaam kar raha hai, ya nahi. Ye to hui social share button ki. Ab baat karte hain. Social follow button ki. Ye Facebook follow button hai. Jisase apke users apko Facebook me follow kar payenge. Jitne me red color ka, mera Facebook page URL dikh rakh hai. Utne me apko apne page ka URL dalna hai. Fir apka code ready ho jayega. Wapka site me lagne ke liye. Is code se users apko twitter par follow kar payenge. Apko do jagah code change karna hai. Jahan red color se hamne batayahai. Mera url or username hata kar apna rakh lijiye. Ye dono to rahe alag-alag code. Par ham apko ek or code de rahe hain. Jisme bahut sare social follow icon hai. Isme apko pure 9 social follow icons milenge. Is code ki khas baat ye hai ki, is code ko ap apne CSS style ke color ke hisab se, is code ka color bhi change kar sakte hain. Color code ko hamne red color me likha hai. Yaad rahe. Agar ap dono color change karte hain. To apko ek color dark or ek color light me rakhna hoga. Tabhi icon najar aa payenge. Or ap jo social sites use nahi karte. Us social sites ka code remove kar dijiye. Apki suvidha ke liye. Hamne social site follow code ko alag-alag kar ke diya hai. Apko koi pareshani nahi honi chahiye. Apko har social follow code par, apna social follow url dalna hai. Koi jaruri nahi ki sare url www se hi suru ho. Apna url sahi dalenge. Tabhi code work karega. Wapka website me new page kaise create kare. Wapka website par comment box (request box) kaise lagaye do tarikon se. Wapka website ka advance SEO kaise kare. Mere khyal se social follow icons hamesha header me hona chahiye. Jaise ki mere site ke header me, mere social icons hai. Apko bhi header me lagana chahiye. Iske liye bhi apko wapka header page me jaye. Header pag me jaiye. Fir :: EDIT SITE (#) :: me jana hoga. 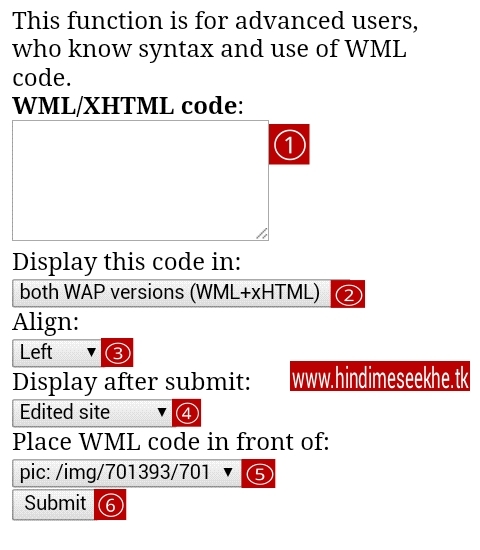 Fir WML/XHTML code me jaiye. Yahan social follow code rakhe. Jo code ap lagana chahte hain. Agar ap apne page ka url nikalna nahi jante. To Ye post padhiye. Note: apne dekha hoga ki, ham har code green or red color me rakhte hain. Green color ke code ka matlab hai. Ki us code ko change nahi karna hai. Vo code thik hai. Or red color ke code ka matlab hai. Ki wahan ap changes kar sakte hain. Lekin dhyan se kare. Kyunki ek bhi code agar remove ho gaya. To pura code bigad jata hai. Call me mam. Ap jis website ka facebook share code mang rahe hain. Vo code apko unse hi mangna hoga. Or us code se sirf FB par shere hoga. Anya jagaho par nahi.